Danish doctor and scientist Jens Christian Skou, a joint recipient of the chemistry Nobel prize in 1997, has died aged 99. Skou was awarded a half share of the Nobel for discovering the sodium–potassium pump, an enzyme that transports sodium and potassium ions across the membranes of cells and is crucial for the normal functioning of nerves and muscles. The other half was divided between Paul Boyer and John Walker for their work on the synthesis of adenosine triphosphate (ATP). Skou was born in Lemvig, Denmark, in 1918. He developed an early enthusiasm for science at school and went on to study medicine at the University of Copenhagen. After his clinical training he worked part time as a medical doctor while studying local anaesthesia at the University of Aarhus. He became more interested in academic research, eventually giving up surgery and publishing a doctoral thesis in 1954. His research interests shifted from anaesthesia to cell membrane physiology and the active transport of cations in biological cells, which ultimately led to the discovery of the sodium–potassium pump Na+, K+-ATPase in 1957. This brought Skou into contact with the wider academic community and helped attract funding and students to his department over the following decades. 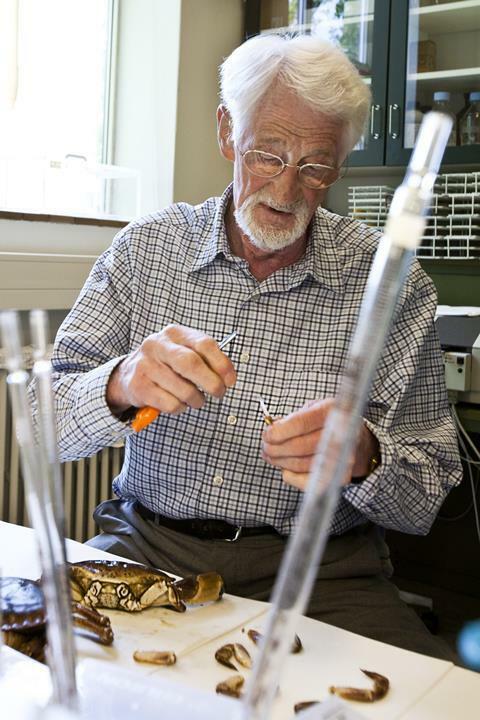 He officially retired in 1988, but kept an office at the university and continued to participate in research, publishing his last paper in 2015. He has advocated for non-targeted research funding and colleagues at Aarhus University say his ‘achievements both as a researcher and as a person will always be a source of pride’. His death came just four days before that of his fellow 1997 chemistry Nobel laureate Boyer, who also died at the age of 99.